You can purify water with heat. Does this provide enough heat to do that? Can you melt things with it? etc. 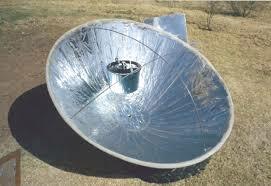 Comments for Can you use a solar cooker for other things? Yes, that kind of solar cooker, the parabolic cooker in the photo you posted, can get very hot and has no problem with boiling water and melting things. In fact most of them will do it as fast as or faster than your regular gas/electric stove in your house. We use our various parabolic cookers for deep frying, pressure cooking, and all kinds of regular cooking. If you look around this site you will see lots of pages and photos of these kinds of solar cookers as well as the box and panel cookers cooking things without any problem.